Dimensions: 25" x 15" x 11"
The Model 150 offers all the musical benefits of the two smaller EPI models [ed. 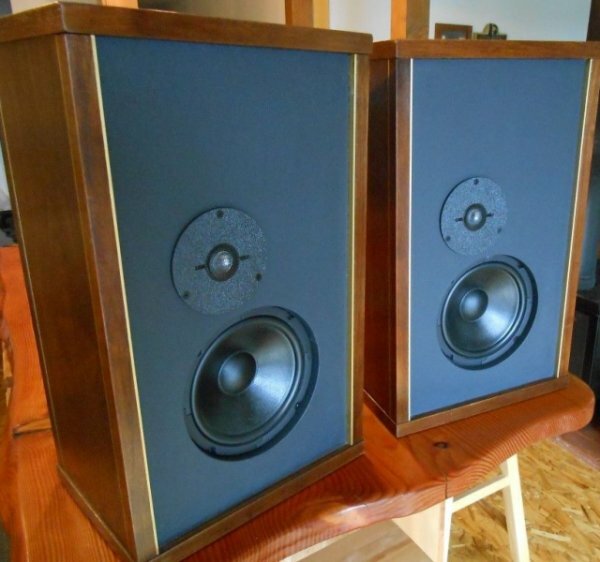 note: the Model 50 and Model 100] in an attractive, more easily positioned cabinet styling. 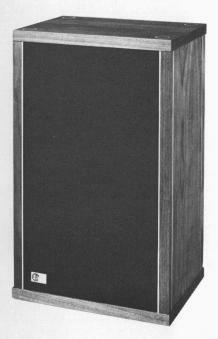 Using the same great EPI 8" module, this cabinet attains a system resonance of 35 cycles. This allows linear woofer operation down to the primary octave of all musical material even when positioned in a free standing location away from the walls in the centre (sic) of a room, or similarly in the centre of a large bookshelf. Depending on the size of the room a two wall positioning may be preferable. New construction and design principles are utilized in the Model 150 to provide an optimum combination of high performance and decorative cabinetry appearance. Functional in this design are the four anodized metal extrusions in each side which [are] first joined to solid walnut corner pieces [and] are then attached mechanically to top and bottom caps (both one inch thick) where the walnut plugs are accented by circular brass inserts. As a finished piece of furniture, the Model 150 is a handsome creation of gleaming brass, rich solid walnut and a dark warm grill cloth. In a vertical position its 25" height makes an attractive end table. An 11" depth and beautiful symmetry permit its use as a magnificent bookshelf system as well.